A Short Sleeve Crochet Top. Measure your bust circumference, divide by 2 and add 2cm. It will be the width of your top. There are two squares to make a width. 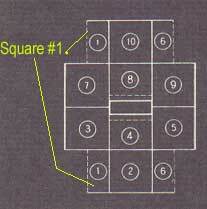 Hence, side of a square is half as large as the width of the top. Bust circumference is equal to 96 cm. Width of the top: 96 cm / 2 + 2 cm = 50 cm. Necessary side of a square: 50 cm / 2 = 25 cm. For the cotton thread in size No 10 hook 8 (1.5 mm) works well. Threads No 20 and 30 will require a thinner hook 10 (1.25 mm). To make this crochet top, you will need about 250 grams of he cotton thread. The Stitch Pattern for the Crochet Top. Each motif is a square crocheted in rounds. There are 25 rows in each square. 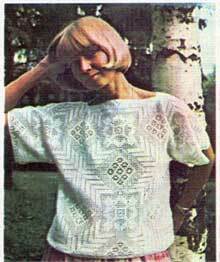 On this crochet top pattern you will find only 10 of the rows shown COMPLETELY. Rows from 11 to 25 are shown for the two sides of the square only. Be sure you Crochet all 25 rows for four sides working in rounds. 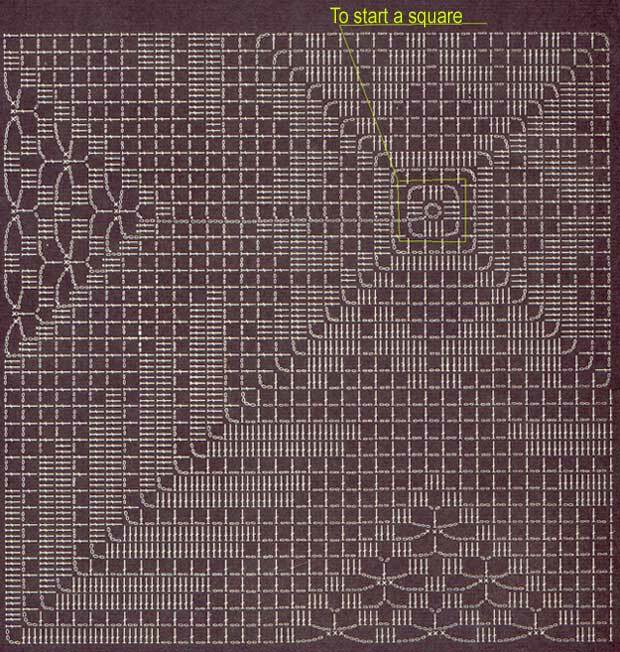 Check Crochet in Rounds page for the information about reading patterns in charts and Crochet Patterns page for the International crochet symbols if necessary. Important note. Check dimensions of the first square once you've finished it. They can't be less than you calculated for your size. It will still work for this casual model if the side of a square is 1 - 1.5 cm greater then you calculated . Sew all motifs together follow the layout excluding adjacent sides of motifs #4 and # 8. Note, that motifs # 1 and # 6 are sewn both to the front and back side of the top. To shape a neck line: fold 5 external rows of the motifs #4 and # 8 toward the back side of the top and accurately sew them to it. Crochet 1 row of the single crochets around the neck line. Crochet 1 row of a double crochet and 1 row of a single crochet around the edges of the sleeves and the bottom of your top. You can use this design idea to make your own models of a top. Just be creative: use different stitch patterns for the motifs, combine different threads and colors, change the layout of the squares, and etc. For example, to crochet a sleeveless top, you will need only 8 squares. Just make a couple of inserts between the two groups of four squares to form a neck line.